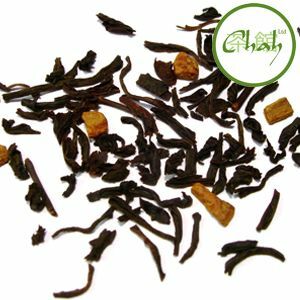 Chai tea is a spicy warming tea from India. It’s real a winter time favourite that’s ideal for those cold January or even August nights (we are based out of Britain after all). What's in this Chai then? Tea, Ginger, Cinnamon, Coriander, Fennel, Nutmeg, Black Pepper, Cloves, Ajwan Seeds, Cardamon, Hibiscus, Apple, Rosehip, Orange Peel, Lemon Flavour and Lemon Oil. If that's not enough, add a little extra and make it your own. The dudes recommend chocolate, vanilla or peppermint, but please, go nuts and let us know what you recommend and you might find your own suggestion featured on this very website! Serve: 2tsp per cup of boiling water allow 2-3 minutes to infuser or longer if desired or to alternative recipe.